If you are one of those people who wish to keep the bathroom more intimate and relaxing, you will need lighting that will set the mood. For most people, bathroom lighting is not as important as the other elements in the bathroom. The common mentality is that unlike the other rooms, the bathroom is one area in the house that does not require much focus on lighting. If this is how you think about it, did you ever consider that the bathroom is a closed space with little windows? This means there is not enough light that comes in it during daytime and definitely none during nighttime. In other words, lighting is important for many reasons. One is for safety purposes. The bathroom is a damp and moist place that is prone to accidents. Without proper lighting, you may not be able to see what it is that you are stepping on. You could either bump on something or land on the floor for slipping. Regular households have fluorescent lights on their bathrooms. While this is sufficient enough for practicality’s sake, it may not be sufficient enough for the ambiance. If you are one of those people who wish to keep the bathroom more intimate and relaxing, you will need lighting that will set the mood. There are different shapes, shades, and sizes for bathroom lighting. These are available online and in the malls. Searching for them should not be too difficult since there are plenty of designs that will suit your needs. If you do not have much time to hop from one mall to another to look for bathroom lighting, then it is best to look for it online. It is also convenient since all you need is to sit in front of your computer and compare designs and prices from different stores. You will also get to see and canvass more stores and shops online. At the same time, you can purchase them with just a few clicks on your mouse. Buying lighting for your bathroom does not need expertise. It only needs creativity, style, and taste. If you need to be inspired, there are many magazines and online zines that will help you get there. 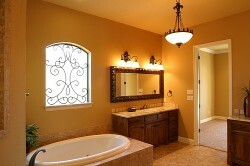 You can look at different pictures of bathrooms from high end to simple yet relaxing.